Clean shower tile grout isn’t an easy task as it is shown in TV commercials. It takes a lot of efforts and the right process to do so. Cleaning a bathroom tile is the hardest thing especially the grout between the tiles. It gets stains easily and the dirt gets trapped deep down inside. It is a home for bacteria in humid and warm weather and thus is unhygienic. Tile and grout cleaning is necessary so as to prevent certain health issues which the bacteria can cause. Also, a wrong cleaning process can make the matter worse. Using acid-based cleaners can weaken and dissolve the grout which will cause water leakage behind the tiles. This can further complicate the process. 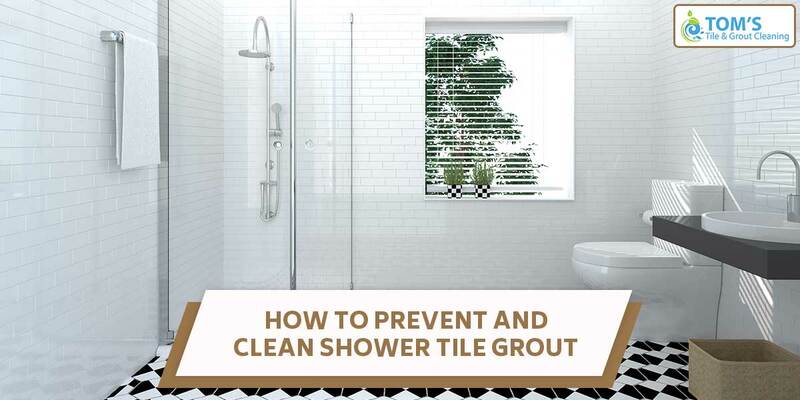 In this article, Toms Tile and Grout Cleaning Professionals will show you the ways to clean shower tile grout. First, let us learn about some of the preventive measures you can take so as to make your job to clean shower tile grout. This is the most important step so as to prevent the mildew and debris to penetrate the surface. You can find the grout sealers in the home improvement stores which are available in roll-on and spray varieties. Read instructions properly and use accordingly. Since mold thrives in humid conditions, make sure you use bathroom ventilation fan so as to prevent the formation of the same. Leave the bathroom door open for some time for ventilation. After you use the bathroom, make sure you wipe the tiles. Removing the excess water will prevent its soaking by the grout. Though there are a lot of commercial products available for tile and grout cleaning, make sure that these don’t contain acids such as vinegar or citric. It can make the problems worse for you. Some of the products can also cause uneasiness in respiration or dizziness. The fumes can be irritating. Make sure that the bathroom is ventilated while using these products. Also, avoid mixing several cleaner products. The chemicals present may react violently with each other and may release toxic fumes which can be harmful. Use one cleaner and stick with it. Using nylon brush and a bit of dish soap can be the best way to get rid of stains. Make a paste using baking soda and water. Apply it on the tough stains and leave it overnight. Rinse it with hot water. This is non-toxic and is available in many stores. Use it with water and scrub on the grout. Rinse with hot water. Make sure to read the instructions carefully. Lemon has a lot of acidic properties that come from citric acid. You can use this to get the brightest and cleanest of tiles. Add lemon juice to lukewarm water, the quantity of the components can vary according to your needs. Dip a sponge in the mixture and work on walls from top to bottom. Make sure you wear gloves while doing so if you have cuts anywhere. Toms tile and grout cleaning professionals reckon you to use organic elements if you clean shower tile grout on your own. Why Should You Prefer Natural Cleaners for Shower and Tile Cleaning? There are numerous advantages of natural cleaners. They are cheap, environment-friendly and don’t include mystery chemicals which can be harmful to you. Though they may take a little more work, they should be preferred. To know more or get tile and grout cleaning services done across Melbourne call Toms Tile And Grout Cleaning Melbourne on 1300 068 194.